I was convinced that Thomas Harris deserved a place amongst these well-known impresarios of the eighteenth century, at the very least. The Anthony Denning Award from the STR inspired me to research Harris’s life and begin work on the first biography. 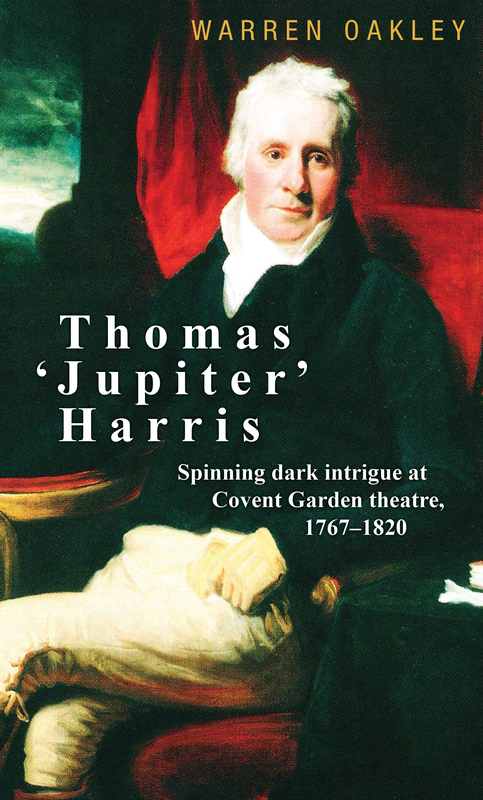 And now, seven years later, Thomas ‘Jupiter’ Harris: Spinning Dark Intrigue at Covent Garden Theatre, 1767–1820 has appeared with Manchester University Press. Harris was most visible as the man who controlled Covent Garden theatre for nearly five decades, one of only two venues in London allowed by law to perform spoken drama. But, as I discovered, this career was only one of many: he became the confidant of George III, a philanthropist, sexual suspect, and a brothel owner in the underworld of Covent Garden. While deeply involved in Pitt the Younger’s government, Harris worked as a ‘spin doctor’ to control the release of government news. As novelists created elaborate storylines with fictional intriguers lurking in the shadows, Harris was the real thing. However, at the centre of his life was always the survival of his theatre. Warren’s book can be bought from the Manchester University Press website here.